Posted on Tuesday, September 9th, 2014 at 11:24 am. Soroptimist International (SI) Programme Director, and member of SI St Albans and District, Hilary Ratcliffe, has been made an “Officer of the Order of the British Empire” (OBE) in the UK Honours List , recognising her achievements in promoting gender equality around the world. A Soroptimist since 1980, Hilary lives in Harpenden and is an active member of the St Albans and District Club. 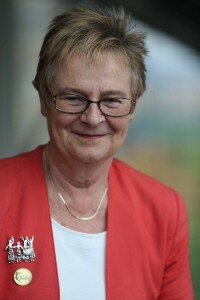 She has been Club President, Regional President, Chair of the Soroptimist UK Programme Action Committee, SI Great Britain and Ireland Federation Assistant Programme Director for Education, Federation Programme Director and has been International Programme Director since 2011 – a post that will have its grand finale at the SI Convention in Istanbul in 2015. Hilary spoke to the Club about her award, she thanked the Club Members saying “I feel it’s your award as much as mine, it’s as a result of all the work Soroptimists do around the world – like my own Club “St Albans and District” – and I couldn’t have done it without all of your support so thank you!” – at which point everyone there stood up and gave her a massive round of applause and cheered. Hilary celebrated her award with her Club with sparkling wine and a special cake – see pictures above and right. Alongside her voluntary work as International Programme Director, Hilary is active in her local Harpenden community, she works as a freelance tour guide in London and the South East of England; she is a trained City of London Guide, Blue Badge Guide and St Albans City Guide. Before this, she spent many years as a teacher of history in secondary schools and further education colleges and was also responsible for providing pastoral support and personal and social education to sixth form students. The UK Honours system recognises outstanding people for achievements in a range of fields, with various levels of award. Awards are announced twice a year, at New Year and on the Queen’s official birthday in June. “This is a wonderful accolade for you, for your commitment to this cause and for the work undertaken by the International Programme Team”, writes International President Ann Garvie in a message of congratulation. As International Programme Director, Hilary leads Soroptimist International’s advocacy and policy work at the UN and other international forums, speaking up for women and girls and representing the voices of around 80,000 Soroptimists in 130 countries and territories worldwide. She provides guidance and inspiration for thousands of on-the-ground Soroptimist projects to educate, empower and enable opportunities for women and girls, helping to share good practice across the world, while developing global policies and position statements based on the experience of Soroptimists worldwide. The Club is hugely proud of Hilary and were delighted to be able to celebrate her award with her and wish her many congratulations in person. We can’t wait to hear about the visit to the Buckingham Palace when Hilary collects her award.